1. Log into the SharePoint site and go into the document library where the document should be uploaded. 3. The Upload Document dialog box will appear. Click Choose File to select the file to upload. If the file has the same name as one that is already present in the document library on SharePoint, select the check box to overwrite the existing file if desired. After selecting the file, click OK.
4. 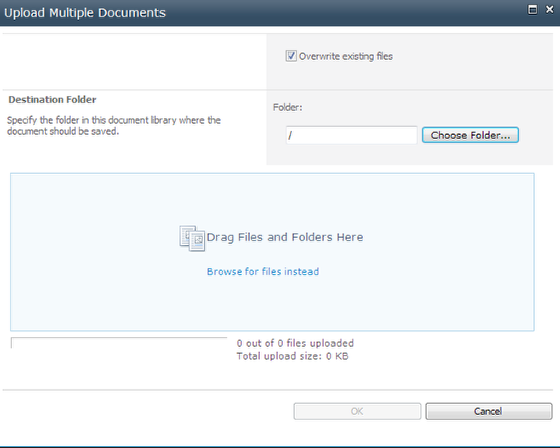 To upload single or multiple documents, click the Documents tab on the ribbon (once already in the Documents Library). 6. Another way to add documents is from the Upload Document menu. 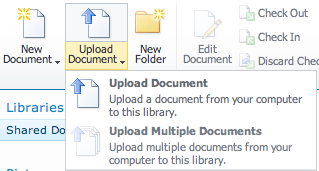 Clicking this menu displays two choices: Upload Document or Upload Multiple Documents. If selecting Upload Document, follow the instructions provided in Step 3.